The Vulnerable Children Act & Your Practice. 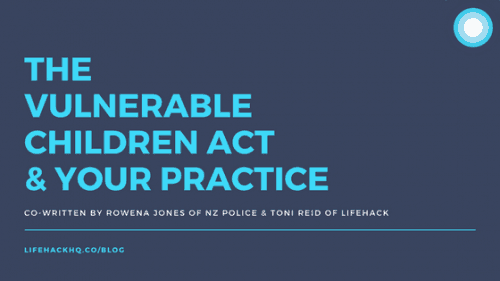 Co-written by Toni Reid (Lifehack) & Rowena Jones (NZ Police). We teamed up with Kaitaia Constable and 2017 Flourishing Fellow, Rowena Jones, putting some questions to her about the VCA. Thanks also goes out to Kelsey Brown (2016 Flourishing Fellow and Senior Advisor at OCC) for linking us in with resources. This blog post is a guide to applying the Act, but it’s not legal advice. If in doubt, chat to a lawyer to ensure you’re meeting your responsibilities under the Act. Rowie, what is the Vulnerable Children Act all about anyhow? The VCA is in place to develop a safe and competent workforce through comprehensive safety checks. It exists to protect the most vulnerable young people in our society. Anybody who works alongside young people needs to be checked to ensure they’re safe to work with youth. There are two general parts to safety checking: the first is the recruitment process and the second is Police Vetting. Oranga Tamariki (the Ministry for Vulnerable Children) hosts a significant amount of information for employers, organisations and individuals relating to the VCA. You can access it by clicking here. If you are in the education sector, the Ministry of Education have collated a comprehensive resource list here. Interested in how the VCA came to be? If you’re an oral or visual learner, check out this video where children and young people talk about the Green Paper on Vulnerable Children. I’m thinking of starting a new initiative on my own (i.e. without organisational backing). I’ll be working directly with young people, what should I do? Are you receiving receiving government funding and delivering social services or education? Then you need to be registered with an organisation. If you’re self-employed or an owner-operator, you need to use the Ministry of Health’s service that enables safety checks. Just visit www.cvcheck.com/nz to get this started. To align with best practice, you’ll need to ensure that you have Child and Youth policies in place and make those well known to young people and their whānau. It is especially important to be clear about how to make a complaint and what to do when things go wrong. Oranga Tamariki have a downloadable resource to support robust organisational policy development, we recommend you check it out. I’m only volunteering in my work with young people, do I still need to get vetted? That will depend on your organisation and the capacity of your volunteering. Your best bet is to check the policies of the organisation you’re volunteering with and this handy guide by Oranga Tamariki. For example, if you’re volunteering for the OSCAR programme (a before/after school and holiday programme) then yes you need to be vetted. The OSCAR programme is state funded and you’ll be working directly with young people. You might not be a core staff member but you still need to be vetted and safety checked. When I started my job ages ago I was Police checked, what else do I need to do? Any organisation that works alongside young people will have a process. Everyone has to be re-checked every three years, and while the legislation is being rolled out there are specific timelines you need to be aware of. This picture explains the timeline. It all depends on whether you are a ‘core’ member of the organisation, and whether you’re a ‘new’ or ‘existing’ member. New Core checked from now. New non-core checked by July 2016. Existing core checked by July 2018. Existing non-core checked by July 2019. As an employer, do I need to anything other than just the Police vet? Yes! Police Vetting is only one part of a safety check. Don’t get lulled into the sense that the Police vet means you’re good to go. There’s a bit more to it. Interview the person. Include questions around the VCA such as “do you have any current charges or investigations? Or any previous convictions?” Ask for a copy of their CV, as this might show some unexplained gaps in their life history. The Police vet only reveals convictions, so do make sure you ask about active charges or investigations. Choose your questions carefully. Complete reference checks. Use previous employers or people that know them. There are no specific questions to ask. You just need to be satisfied that this person is safe to work alongside children and young people. Complete third party checks with licensing authorities of governing bodies or professional organisations. Complete Police Vetting process. Only once you’ve completed those other steps do you then get to the Police vet. For more information about how recruitment and the VCA intersect, check out this guide by MVCOT. I’m a parent. 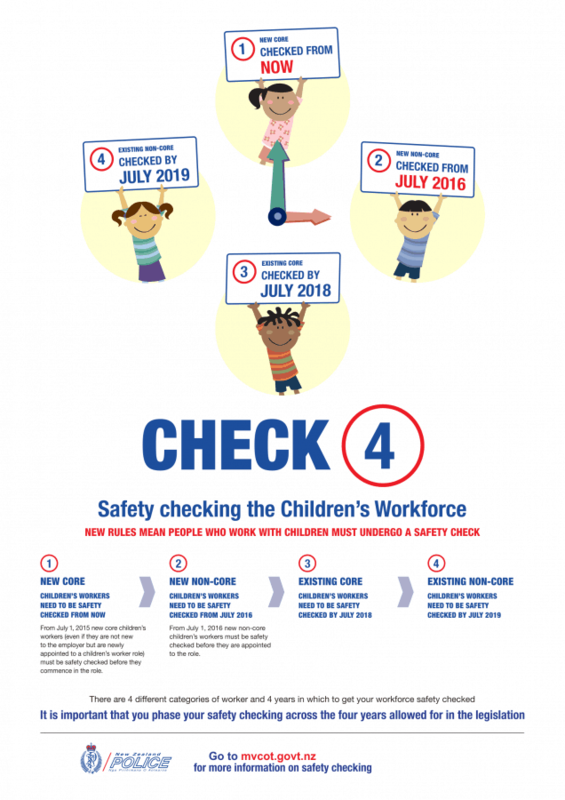 How do I know if an organisation has safety checked their staff? You just need to ask the organisation. There is no formal list for you to check, and no governing body. Do your own due diligence and ask to see the organisation’s child and youth policies. A big mihi to our favourite Kaitaia Constable, Rowena for answering our questions. If you have any questions about the VCA and your initiative, you can find links to best practice on the Oranga Tamariki website.